Last spring, I had the chance to tour DMZ, the barrier that separates North and South Korea [blogpost]. More than a piece of land filled with tourists, DMZ is a frustrating reminder of the post-war division in the Korean peninsula for more than 70 years already! Now I'm thinking, is a United Korea still an impossible dream? This is the train station (Dorasan) that once upon a time connected North and South Korea. It has been restored, but still not operational till the unification. Bridge of Freedom, where nearly 13,000 Korean War prisoners were traded off. At the end of the bridge are walls with colorful ribbons tied by families from South Korea with messages to their family members separated to them, in memorial of family members who died in the North, or by Koreans born in the North to honor ancestors during Korean holidays. Despited the unrelenting North Korean nuclear aggression, a civic-led movement continues to voice stronger calls for an end to the post-war schism. Known as the One K Global Campaign, this movement is taking its campaign to a GLOBAL LEVEL as a means of rallying INTERNATIONAL SUPPORT for Korean unification. "Unifying Korea is about forging LONG-TERM PEACE and creating NEW OPPORTUNITIES in the peninsula. Bringing the two Koreas back together would be tough, but we can AND SHOULD MAKE IT HAPPEN," said Action for Korea United (AKU) Co-Chairman In-teck Seo. The division of the Korean peninsula traces back during the end of World War II and the outbreak of the Korean War, which caused the deaths of more than 2.5 million people, the separation of more than 10 million individuals from their families, and the suffering of more than 25 million Koreans under a repressive regime. Now why are they taking this movement outside Korea? North Korea's nuclear program is a WORLDWIDE THREAT to peace and prosperity. In this day and age, everyone's connected and affected. To make this "One Korea" dream a reality, the One K Global Campaign taps the worldwide phenomenon hallyu or the Korean wave, by bringing in popular K-POP artists to spread the cause through their music. In 2015, more than 30 K-Pop artists supported the One K concert at the Seoul World Cup Stadium. The concert featured the unification song, "One Dream, One Korea", which earned more than 13 million new YouTube impressions from over 200 countries. Going global this year, they come up with another song inspired by the United Support of Artists for Africa's 1985 inspirational hit "We Are The World". Grammy Winners Jimmy Jam and Terry Lewis will help compose this new anthem. A concert tour promoting this campaign is scheduled in countries like China, US, and Russia. The Manila leg is happening already this week, March 2, 2017, at the SM Mall of Asia Arena! I feel fortunate that they chose the Philippines for one of their stops! 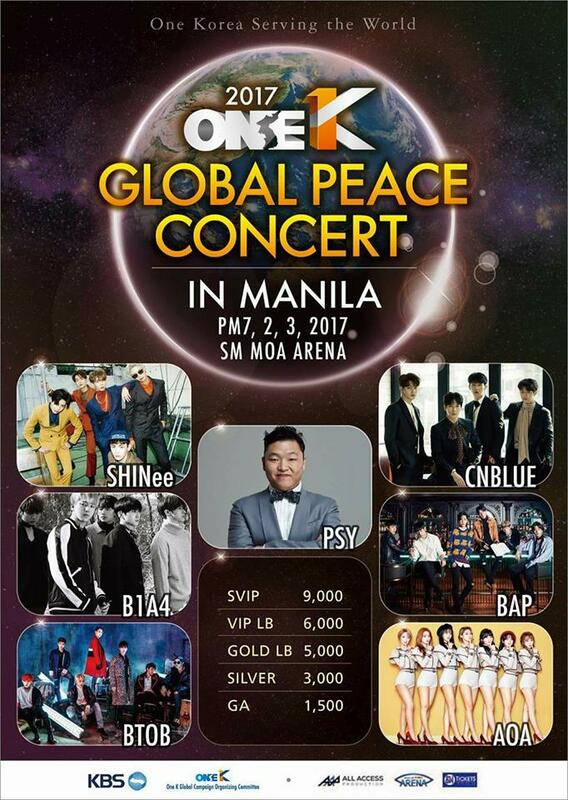 The concert will feature K-Pop superstars Psy, SHINee, CNBlue, etc. It is already 2017, and we still have wars and divisions. My emphatic side made me think of the families and friends separated from each other because of this. It's a heartbreaking thought, but if South Koreans believe that there is an end to all these, I support them in their cause! I hope to see you at the concert as we unite for peace in the Korean Peninsula and even the WORLD. To see a One Korea is a dream that I hope to witness in this lifetime. Purchase your tickets online via SM TICKETS. Remembered the scene in Dots where they fought for the unity of North and South. It must be great to see that one day we no longer have to say South Korea, Korea nalang! Prayers for you Korea! !